Please use a proper LiPo charger and charge the cells in a LiPo sack, at no more than 15A. Cars must be complete (for example wheels missing, damaged body or shells) this is to stop people and the clubs kit from being damaged. Drivers must go straight out to marshal after they have finished their race. Anyone not using a 2.4GHz radio system must have three different crystal sets. Rules are based on the BRCA rules, except where the following club rules apply. Heats will be of 5 minute duration, finals will be 6 minutes. Any slick rubber tyre. No foam tyres, mini-spikes or tyres with block tread. Any Touring bodyshell is allowed as long as it is cut along the manufacturers lines and does not have extra cooling holes. The 'Blinky' class is for ESCs that have a 0 timing advance at all RPM, driving 13.5T or 17.5T motors. The speedos have a blinking light when switched on and in the neutral position. The class is designed to provide close racing because all cars should have broadly similar straightline speeds, and speeds that an average 'club' racer can cope with. Speed controllers must be on the BRCA's list of blinky speed controllers and set up as specified click here for list. This list has been taken from the ROAR list and all these speed controllers have been tested to meet this specification. 27T brushed motors may be used in this class. Cars may not weigh less than 950 grams. 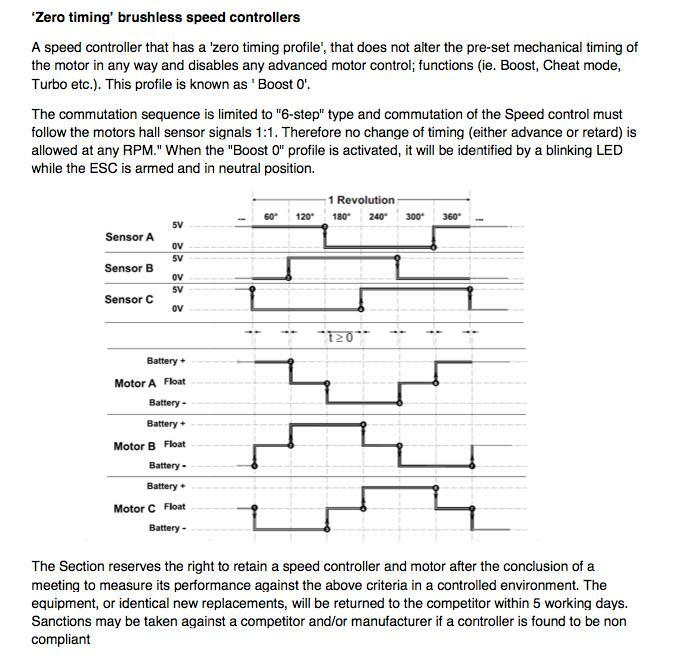 Brushless speed controllers must be on the BRCA's list of blinky speed controllers and set up as specified click here for list. This list has been taken from the ROAR list and all these speed controllers have been tested to meet this specification. Cars may not weigh less than 730 grams.